Takeaway: We should read more of what we want in order to develop a love of reading and worry less about developing ourselves by reading ‘what is important’. This is a book that just makes sense. The basic idea is that we should be reading more of what we enjoy and not pay as much attention to the books that ‘everyone’ says we should be reading. This works for me for a number of reasons. 1) When we enjoy what we are reading we are more excited to read it. I am usually less interested in books I am reviewing than the books I am just reading because I picked them. So even though I could read virtually unlimited number of free books if I just read review copies, by choice I usually only read 1 or 2 books a month for review and I only pick review books I am very interested in. 2) Elementary teachers and librarians know this. So the good reading teachers I know spend a lot of time working with kids to find books that the students are really interested in. Large group discussions are useful in training kids how to read, but not as useful as helping children become excited about reading. 3) Twenty years after graduating from High School and 12 after getting my second Master’s I am reading three times as much as I did then, and learning a lot more than I did then, even though I went to some of the best schools in the country. Self directed learning is often the best type of learning. Jacobs quotes more people than almost any author I read. Most pages have at least two quotes, that are dead on topic and in support of his ideas. This helps the book feel much more wide ranging than it really is. It is only about 150 pages, but in a very good way feels more weighty. Like the good literature professor that he is, he wants us to learn to think for ourselves. “Now, I could simply wag a finger here and emphasize the importance of developing independence from others’ judgments, a mature indifference to their assessments of your (or anyone’s) reading habits. And indeed that would be a wise course to follow. But for those who struggle to achieve such moral self-sustenance, there is an alternative. It’s called lying.” And that is where he loses some readers. He actually says, he would rather us google some quotes on a book so we can pretend to have read it, rather than moving our eyes across the page just so we can cross it off a list. I understand why people want to appeal to ‘the great books’ and authoritative lists. But lists are for common cultural understanding, not learning. If we are about learning, then what is important is what we are interested in. Like I said, to me the argument just makes sense. 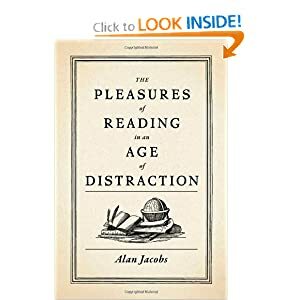 The book also spends time encouraging us to read the books that are weighty more slowly (Jacobs says fast reading is a sign that we really do not want to be reading) and to read books again. I am working on the slower and more careful part and I have intentionally started re-reading at least 1 or 2 books a month. If you love reading, I think you will love this book about reading.